36th Ulster Division Limited Edition Mini Lambeg Drum With Stand | Battle of The Somme : www.minilambegdrum.com, by Irish Shopper Ltd. This Mini Souvenir Lambeg Drum is in Memory of those in the 36th Ulster Division who fought and died during the Battle of The Somme, 1916 . The 100th anniversary of the commencement of the Battle of The Somme is on July 1st, 2016, the battle lasted until November 18, 1916. Drum Size : Dia.11.5 x W.10.5cm (Dia. 4.6 x W. 4.2inch). Suitable for display in a cabinet, table or area of your choice. 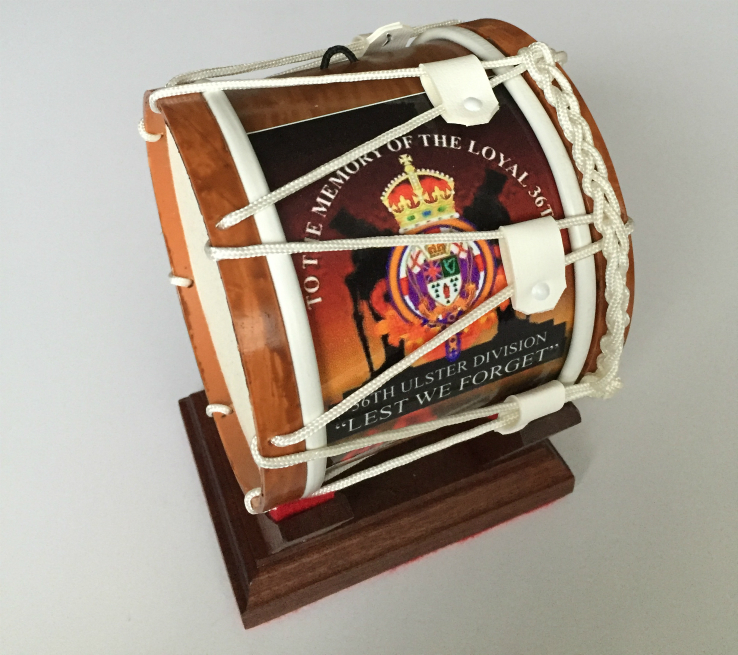 Each 36th Ulster Division Limited Edition Mini Lambeg Drum will have it's own mahogany display stand included . All items will be packaged carefully for posting. The leading battalions (of the 36th (Ulster) Division) had been ordered out from the wood just before 7.30am and laid down near the German trenches ... At zero hour the British barrage lifted. Bugles blew the Advance. Up sprang the Ulstermen and, without forming up in the waves adopted by other divisions, they rushed the German front line ..... By a combination of sensible tactics and Ulster dash, the prize that eluded so many, the capture of a long section of the German front line, had been accomplished. During the Battle of the Somme the Ulster Division was the only division of X Corps to have achieved its objectives on the opening day of the battle. This came at a heavy price, with the division suffering in two days of fighting 5,500 officers and enlisted men killed, wounded or missing. War correspondent Philip Gibbs said of the Division, Their attack was one of the finest displays of human courage in the world. To The Memory Of The Loyal 36th - Lest We Forget .